The number of US metropolitan areas that have returned to or exceeded their last normal level of housing and economic health increased to 63 (out of 351) from 60 last quarter. 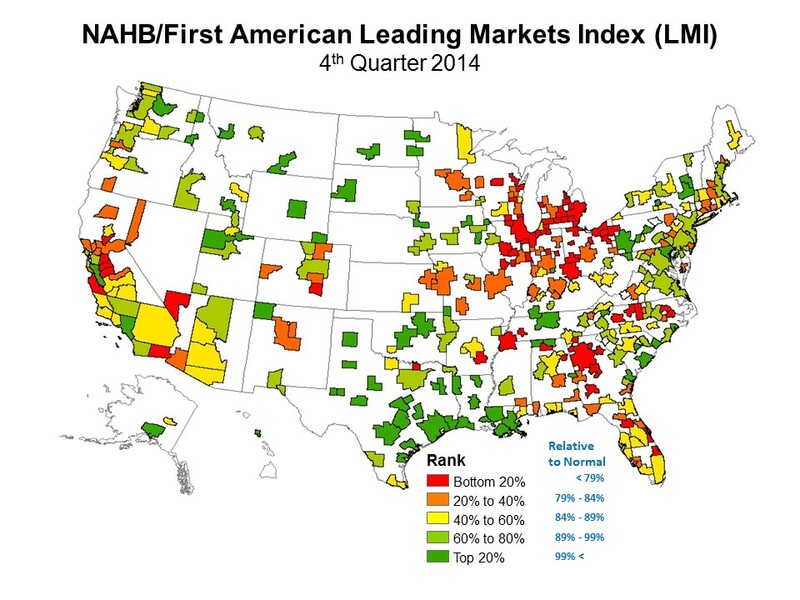 The NAHB/First American Leading Markets Index rose one point to .90 in the fourth quarter of 2014 from a revised .89 in the third quarter 2014. The Leading Markets Index measures a market’s proximity to normal as defined by the level of single-family housing permits, home prices and employment. Permits and prices are compared to the annual averages in 2000-2003 and employment is compared to 2007. Permits and employment are also adjusted for population changes. A score of one means the market is at the same level as the base (last normal) period and above one means the market is moved beyond the last normal. The US level of .90 means the US economic and housing market is 90 percent of the way back to normal using the same base levels. Of the three indicators, home prices are the most recovered, with an index value of 1.31, or home prices are 31 percent higher than the average of the early 2000s. Employment is 95 percent back to the averages of 2007. The housing permit measure is the weakest in terms of returning to normal at .44. Only 22 markets have experienced single-family permit activity that is greater than the early 2000s annual average as the housing market struggles to return to a more normal level. Markets in energy regions have recovered the fastest and are the ones better now than at their last normal levels. The markets with the longest road left are those that collapsed the most and have not had the employment recovery enjoyed by the country as a whole. The bottom two quintiles of markets are heavily concentrated in the industrial Midwest and the Sand states of California, Nevada, Arizona and Florida. All are improving but have a longer distance to cover. ‹ Who Does LIHTC Housing Serve?